Listening to a soundtrack out of context is a unique experience; you are free to create your own mental images of what the music conjures. 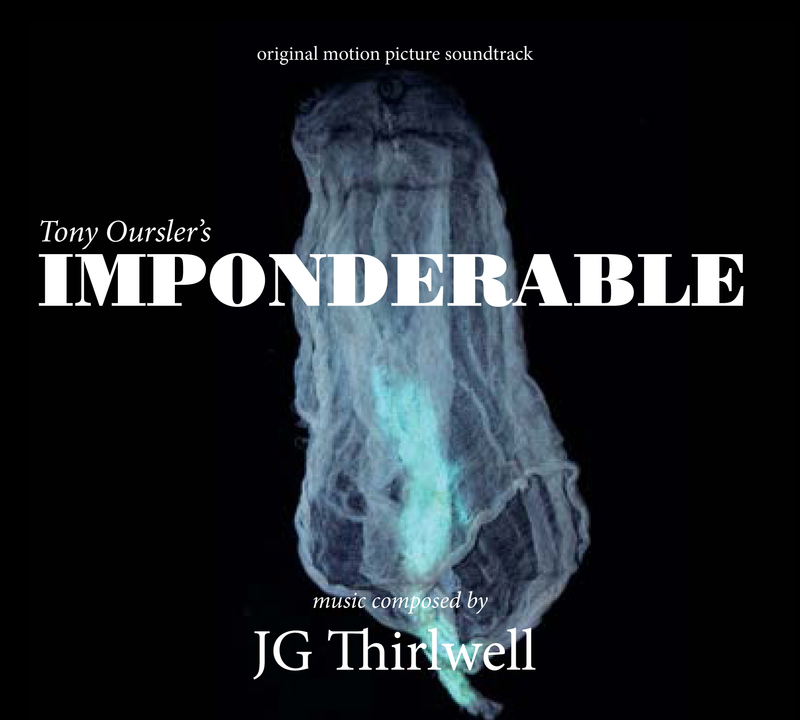 A title like IMPONDERABLE evokes something elusive or occult. Both of these adjectives are applicable to the music JG Thirlwell has composed for Tony Oursler’s multimedia installation. Oursler’s grandfather was Fulton Oursler, a writer who, along with Harry Houdini, was like the Amazing Randi of the 1920s, i.e., someone who tried to debunk spirit mediums and other parapsychology phenomena. IMPONDERABLE is described as an “immersive feature-length film” which addresses the dichotomy between the real and the fake. It includes characters that were also real people, such as Tony Oursler’s grandmother, screenwriter Grace Perkins; Sir Arthur Conan Doyle; and Mina “Margery” Crandon, a spirit medium of the time. The exhibit is presented in “5-D,” described as a “contemporary form of Pepper’s ghost” and also includes items from Oursler’s archive of photographs, posters, letters, and other thematically appropriate ephemera. This description and the impeccable design of the CD sleeve and enclosed booklet elicit a kind of curious dread in the listener, one that is fulfilled when listening to the music. Opening track “Supernatural Bloodmorn” is creepy and unsettling, but not in the usual way that JG Thirlwell’s music unsettles. Along with “Sleep,” it is more of a piece with the composer’s musique concrète compositions and sounds like waking up in the middle of the night and realizing someone is in the house; there are creaking floors, moving curtains, heavy footsteps, and the sound of fluttering wings. Both “Demonologia” and “The Controlling Spirit” continue this eerie feeling, like being trapped on a moving train with an evil entity, the sound of the cold wind wailing in the distance. “Night Nurse” is genuinely weird, with crackling noises and other sounds of mysterious, possibly nefarious, origin that would fit perfectly within the sound design of SESSION 9. Most of the music is instrumental, save “Spark of Life,” whose lyrics (sung by Jim Fletcher) reference not only Mesmer but also Frankenstein; and “Night Nurse Chant,” which is akin to Nurse Ratched telling you exactly what she’s going to do to you. The highlight of the soundtrack is the poignant, beautiful “Faerie Bust” which includes vocals from Thirlwell of the “la la la” variety. The track also utilizes strings, plucked harp, and xylophone to elicit a feeling of genuine heartbreak. Perhaps the most important characteristic of the soundtrack is that it makes the listener want to experience IMPONDERABLE firsthand. While such an elaborate project might not be coming to your town anytime soon, perhaps one day the score will be performed live with a full orchestra. Well, we can dream anyway! In addition to being a Rue Morgue contributor, Leslie writes movie, music, and TV reviews for several other online publications. She considers "À l'intérieur" a perfect film.